Well winter came around, and time in the workshop got shortened, so I got back to the electronics and computers in the nice warm house. I was still struggling with both range and setup of the NRF24L01+ with the Arduino. It just seemed too complex and getting the sensor power down to a usable level required dropping components. I was looking around the web for ideas, and I got distracted by a little OLed / 8266 Weather device. Well, it was available on Amazon Prime and I was stuck on the problem at hand, so I placed my order, and two days later this device showed up at my door. Note: I am not an agent for Amazon, I just think this is a great little project! Now, because of the tutorial, I was able to get this item up and running in just a short time, and it opened my eyes to a new device, while delivering a good product! IN fact, I immediately went back to Amazon, and ordered a couple more of the NodeMCU / 8266 prototyping boards. Then I dove off the deep end with out my floaties! You know how Google, Bing or Duck Duck go searching happens, and then you surface a few hours later? That happened. What I found was a huge eco-structure around this 8266 chip. There were two directions that this led me, and that cost several more hours. Maybe this post will help you if you get started down this same path. Direction One is what I went with due to the Squix path, which goes the route of modifying the Arduino IDE which I think you are probably familiar with if you are reading this blog and following any of the experiments I have previously presented. In short you add libraries into the IDE that allows reprogramming of the NodeMCU. WARNING: I DO NOT YET KNOW HOW TO RETURN THE CHIP TO IT”S ORIGINAL PROGRAMMING – So I will take no responsibility if you follow this path and re-program with the Arduino IDE and any code presented here. This is the original effort and most of the NodeMCU chips come pre-programmed with this code/environment. It is called NodeMCU/Lua. Lua is a programming language that you can do further searches to get more details on. While I like this environment, I think I have not dug into it far enough to get a real feel for this approach. That explanation completed, I learned the IDE modification while making my little weather station. In the same tutorial, it was mentioned that to go beyond the simple receipt of weather info from use of the wunderground API, you would need an external sensor. Well, I did have a couple extra NodeMCU’s to play with so off I went. The really cool thing here was that there was code ready built if you chose to take this challenge. And it was easy, since in the prior posts we experimented with PIR sensors and DHT-11 temp/humidity sensors, I had the needed parts already. Not to mention the 500 or so jumper wires in my parts bin. Then build again was quite simple, and I quickly had the nodeMCU programmed. Now the operation strayed a bit, and I needed to set up an account on Thingspeak. Thingspeak is an on-line cloud service that offers a free section, and some analytic tools that are pretty cool. It has ties to MATLAB, so they definitely want you to grow your data and find you way onto a paying service, it all depends on volume. I went ahead and signed up, so I could “see” the data coming out of my little oLed. You set an API key here, and put that in your programming code so your little device can transmit it out to the cloud, then the weather display can go get that same data and bring it back down. THis was great, I was able to build both parts of this, get an oLed displaying the weather, and the authors code displayed my local sensors temp/humidity from two place in my house, how cool is that, right? Okay, so in all of this writing, I forgot something. Some. Thing. BIG. So why does this excite me so? Simple: You can use your existing wifi to send the data across, and that really plays into my GRAND DESIGN of having everything I want on my sensor network. Woot! But then I crashed again. I really did not want to have to depend on a cloud service to send my data to, and if I got as many sensors as I dream up built, I might have to pay for the service, and that was not what I wanted. I also considered what if the cloud server was off-line, or worse, went away completely? Well, back to the internet, back to searching and searching and searching. IN my next post I’ll get into the tools and techniques I found, and what I did with that info. Stay tuned for more. When we last visited, I gave you a quick view of the details of the openHAB installation process for the Raspberry Pi, and we started configuration of the environment, but left when we got to the rules. Rules are how openHAB lets you know about sensor data. While there are lots of options here, let’s keep this look simple and stick to a simple sensor, the DHT11/DHT22 as built from the MySensors.org web site. To begin, if you are where we left off – good. If not, you will need to be in the configurations directory, under /opt/openhab. A note here about the mappings entry above. You will need to modify this for the ID of your sensor. I modofied the mysensors.org code to statically assign the ID of each sensor. You can also let openHAB set these ID’s, which the sensor will store in eeprom. You will have to match those IDs when attempting to display their data, so the above mappting will have to be customized to your environment, or you will not get any data to display. Now move up a directory, then go to the sitemap directory. And the final step for the base configuration is to put in what is called the sitemap. This will give you a display that can be read in a web browser. if you are using a different computer, simply change localhost to the IP address of your RPi. You now have an operational MySensors / openHAB installation! It has been a fun week, what with colder weather and less leaves to rake, so I got back to the workbench and have been playing with all sorts of Pi projects. The main one over the past couple of weeks has been a PiBBQ monitor, with three probes. One of my buddies and I found a link, and based on some cheapo probes he had from some single temp. monitors, we started the build. We broke it up after I spent an evening trying to get the software loaded on a pi, and another evening building up the ADC circuit on a adafruit pi prototyping board. Now, I will caution you that when you go to build the software, I did run into some problems, but once I failed, we went back to his github page and read the revised readme doc, realized he had a cleaner set of instructions inside that worked much better than the ones on the blog. I also was pleased to find that he both published his schematic as well as had created an actual pcb that you could purchase. I was extremely pleased to find that when I ordered the board set (3 boards for 13.75 including free shipping), that the turnaround was under two weeks! The board vendor was oshpark.com, and they were responsive and nice to deal with!!
. 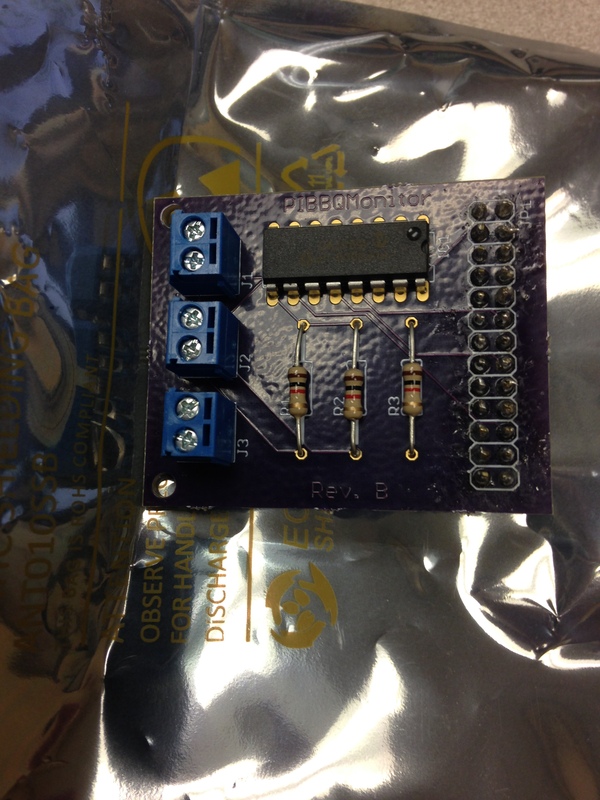 We did find that the prototype board works just like the purchased pcb, so that was gratifying too. we will do another update once we get the unit operating with calibrated sensors. Well, I lied. I said I would write about the MySensor.org Gateway device next, but my groups discussion tonight has been about getting longer output from batteries for sensors. Several posts in forums have provided lots of options. One we really liked was manicbug’s solution with custom programmed chips and custom made boards. This approach really appeals if we can find everything we need, and his total cost per sensor module is about 12.00!!! You can read his posting with the details on his wordpress site. maniacbug – low power sensors . He has posted his board artwork for free, and the studio he used will do ten boards for 10.00!! More research will have to be done, but for the temp/humidity and PIR boards this may be too good to pass up. He also explains his sleep library to get the longest time from his batteries, good stuff!